works perfect and a tremendous help ! Well Constructed. Safe. Easy To Use. Makes it so much easier to raise my chair. I don't have to stretch my arm because it is right at the top. Easy To Use. Safe. Well Constructed. I'm the caregiver. My Dad really is pleased, with the Lever Extender. 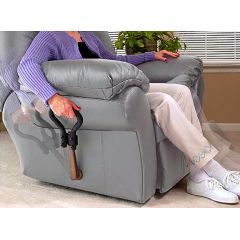 It helps him, lift the foot rest, on his recliner, easier , now. by Mr. Needy from St. Augustine, Fl. Easy To Use. Well Constructed. Safe. Easy To Use. Well Constructed. Really makes the lever on my recliner easy to manuver. lever extender can it be used for inside chair arm ? ?